Reason for using the technology: After using EcoBeaker in their labs for several years, Professor Matt Landis and his colleagues wanted to try a different simulation model. Because EcoBeaker is proprietary software, the instructors weren’t able to answer students’ questions about how the model worked. They also weren’t able to fix software bugs. Using NetLogo allowed Matt to build and modify the model to directly address pedagogical needs. The “Computer Simulations and Evolution of Darwin’s Finches” lab lasts for 3 weeks. In the first week, students form groups, familiarize themselves with the model and choose a topic. For example, they might decide to test how well genetically diverse populations withstand environmental variation. 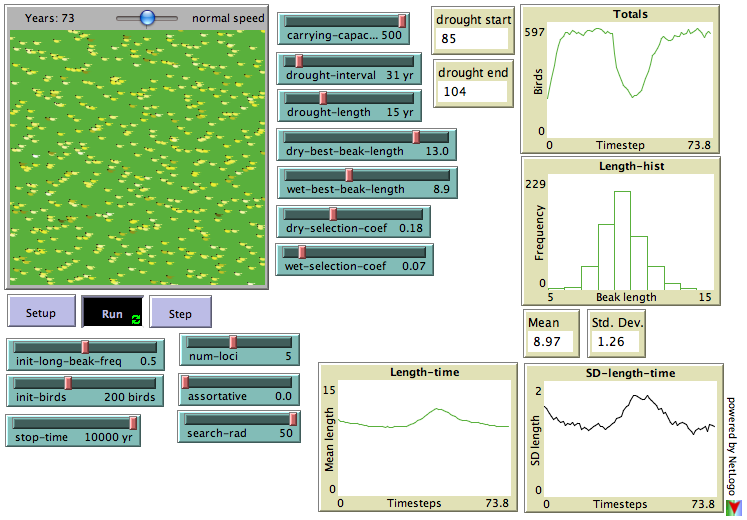 The students will develop a hypothesis, load the model on a computer, adjust the weather with a slider bar, and watch for changes in the population over hundreds of years. In the second week, the students meet with their instructors to refine their topics and review their results. In the third week, they present their findings to the rest of the class. Matt learned NetLogo on his own. 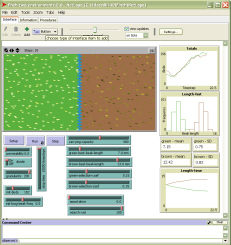 He worked from a model that he had created using other software, and he adapted the lab assignments from an EcoBeaker lab. The NetLogo site has a collection of samples that demonstrate other potential applications of the technology, including chemistry (polymer dynamics), political science (voting patterns), and public health (epidemiology). This entry was posted on June 16, 2010, 11:46 am and is filed under Analysis, Application, Biology, Collaboration, Collect & Capture, Connect & Participate, Create & Edit, Interactive, Knowledge, Modelling. You can follow any responses to this entry through RSS 2.0. You can leave a response, or trackback from your own site.